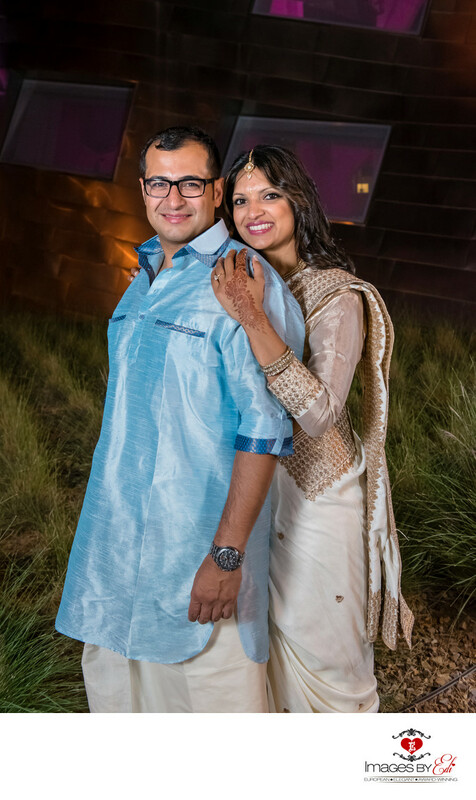 This multicultural Indian Las Vegas wedding was a 2-day celebration. We started on Friday with the official henna party, the Mylanchi. A brilliant, colorful Mylanchi party is one of many vibrant celebrations that are part of a traditional Indian pre-wedding celebration. It took place at the Clark County Government building pyramid cafe. The bride was wearing a white sari, while the grooms outfit was delayed, so he borrowed his light blue outfit from the bride's brother for the pre-photoshoot.